Après la prise en charge à votre hôtel situé dans le centre de Shanghai, prenez le véhicule climatisé pour vous rendre à Zhujiajiao, dans la banlieue ouest de la ville. En route, découvrez l'histoire de 1700 ans de Zhujiajiao. Découvrez comment, comme d’autres villes chinoises de l’eau, il s’est développé autour des routes commerciales des voies navigables et des canaux artificiels le long desquels des marchandises ont été transportées de maison en maison. Au bout d'une heure environ, arrivez à Zhujiajiao et faites une promenade à pied dans la vieille ville en forme d'éventail, avec ses jolies rues au bord des canaux et son architecture des époques Ming et Qing. Admirez les anciens bâtiments et les cours le long des quais abrités par des saules, et prenez des photos des ponts ornementaux. Visitez des sites tels que le bureau de poste et l'opéra de la période Qing, ainsi que des attractions telles que le hall d'exposition d'artisanat de Shanghai et la galerie d'art. Ensuite, retournez au centre de Shanghai et visitez le musée de la soie de Jiangnan. Découvrez comment la soie est fabriquée et achetez peut-être quelques pièces de «l'or doux» chinois, telles que la literie et la mode. Ensuite, continuez vers la rivière Huangpu et embarquez dans un confortable bateau touristique pour une croisière en soirée. Imprégnez-vous de la vue sur les gratte-ciel du Bund et de Pudong, tous magnifiquement illuminés dans l'obscurité, tout en savourant un délicieux dîner buffet. Enfin, débarquez et terminez avec une dépose à l’hôtel. The tour was very nice and well organized. 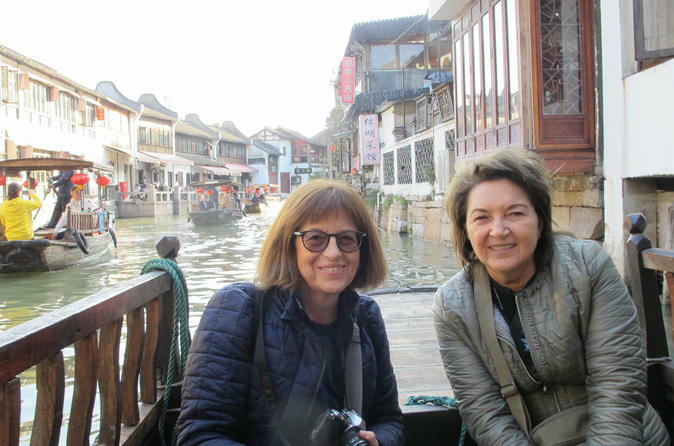 I would have liked if our guide, Leo, would have showed us around a little in Zhujiajiao but we did enjoy the free time. Leo was very knowledgeable about the city and provided lots of insight. He also went above and beyond by helping us with other accommodations and recommendations. He was definitely an amazing resource and knew what he was doing. This is not worth seeing - there's nothing much - our tour guide Jason wasn't helpful either - he's always on his phone and we definitely had lots of free time since he would just leave us quite often and when walking, he would walk ahead of us on his own quite often. The included dinner that was part of this tour was just awful as the food wasn't even hot. It was a very ice Tour . Especialy the night cruise was worth thr money. When in Shanghay, the night cruise is a must. When I booked this trip, I was not aware that I was arriving in Shanghai on the first day of Golden Week, a seven day public holiday in China. That influenced the whole of my experience so please bear in mind that my experience may not be wholly representative, except if you try to do this tour during a public holiday in China. As promised, I was contacted at my hotel by the tour guide the day before the tour. Pick up was to be 10.30, much earlier than the advertised midday pick up. The reason for the early start, it turned out, was that they anticipated the length of time it would take to get to ZhiJiajiao as well as picking up at five hotels. It was just as well that they did, as the 50km journey to the village took two hours after our last pick up, mostly in nose to tail traffic on the highway out of Shanghai. The village of Zhujiajiau is advertised as a traditional water village, steeped in the Chinese way of life and culture. 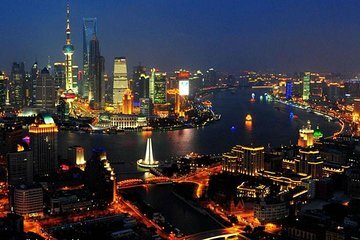 It is popular with tourists and, it seems, the population of Shanghai when they get a chance. On arrival, we were given an hour of free time to explore, but trying to get through the narrow alleyways with thousands of others moving in opposite directions , with police every ten yards barking orders to the crowd took away a lot of the charm. As a result, there was a lot of the village that couldn't be reached on foot. Meeting the rest of the group and the tour guide back at our prearranged spot, it had been agreed that we would take a boat trip back to the car parks. Another guide had arranged for a guaranteed loading time for us, skipping a growing queue of tourists. Unfortunately, this led to an altercation with one of those in the queue, and in the confusion our boatman wasn't instructed where to drop us off. As a result, our group of five were taken to a different part of the village and separated from the others in the group and our tour guide with no way to contact him. Luckily, I still had the tour operators number and managed to contact them for assistance in reuniting us, but not without a considerable delay to the tour. Heading back into Shanghai, again in a significant amount of traffic, we were still running rather late. In hindsight, the group wold probably have not been worried about missing the Silk Museum stop, which is actually a retail outlet selling bedding and mens and women's silk garments, with a small display of how the silk is harvested from the silkworms and processed. The 30 minutes or so we spent there would have been better spent allowing us to enjoy a more relaxed dinner. Food was provided in the form of a buffet dinner at a conference hotel, which seems to be geared to hosting these tours. There were probably another ten groups present when we arrived. Food came out quickly, a dozen different dishes for the table of ten to share along with rice and drinks. A mixture of meat and vegitible dishes suited everybody, They even provided some kimchi for the Korean family on the tour, after they noticed another group being offered it. The dinner was slightly rushed, but still fun spinning the revolving table top to pick your favourite dishes, and some good food. Final stop on the tour was a boat trip on the Huangpo river, to view the iconic illuminated skyline on both sides of The Bund. Others have mentioned having boats almost to themselves or being in VIP sections, but this wasn't our luck. We apparenently had prebooked tickets for the 7.15 departure from the boat dock, again prearranged by another tour guide to avoid having to join a long queue. Only problem was that we were dropped off some 400 yards from the boat dock at 7.10 hence the rushed dinner and had to run for it, dodging stewards doing their best to funnel us towards the rest of the queue. I think we actually missed our intended cruise, which was full by the time we arrived, but we first on board for the next trip a few minutes later. The boat was full, with several hundred other passengers, but that didn't really bother me as I just took a pace on the ships rail and stayed there for the full 45 minute cruise, happily snapping photos in the dark. We were met, back at the boat dock, by the minibus for another trip into the traffic jams of Shanghai, not helped by the area surrounding the Bund being cordoned off for crowd safety. It took another hour or so to get the three miles back to the area close to my hotel, where I was dropped off, about eleven hours after being picked up. All in all, a very long day, but as I said at the start, I have no doubt that the tour would be a lot shorter and more enjoyable when the population of Shanghai weren't on holiday as well. This was a very enjoyable tour and we would certainly recommend it to anyone wanting to experience Shanghai and its surroundings. Leo, or tour guide, was very knowledgeable and full of interesting information about the sites and Shanghai life. The water town was really interesting but we were a little disappointed that the river boat was not included in the cost of the tour as everyone wanted to do it and it really was a highlight. Just a warning .....we were herded to a couple of shops, a Silk shop and a Pearl and Jade shop which were blatant attempts to sell gullible tourists overpriced goods. Not unexpected, but as we had been taken to the exact same two stores on a previous tour 2 days before, it was a little annoying! Not as advertised. No buffet dinner during the cruise. You had to pay extra to get on the top deck on the cruise boat. Many disappointments. Not overly impressed with this tour, was disappointing in a number of areas. Firstly the guide Luna came across as inexperienced and this resulted in many of the issues. First stop was silk factory, interesting to see silk worms and the process to make silk but largely a sales pitch to buy silk products which took up bulk of the time on this stop. Next up was at Zhujiajiao where we walked through to the central area. Luna said very little about the history of the area and made no mention of the boats that travel around the canels until I asked. At which point we were advised this would extra cost AUD8 which was no issue for anyone and the whole tour group did this. I would rather just pay a little extra in the tour cost and have this included. From here we returned to the Bund for the Huangpu River Cruise but were 2 hours early. The Bund is great but two hours of unstructured time on a paid tour and a guide who was unable to give guidance on what we could do in the area was not what I expected. We returned to the meeting point at sunset to meet up with rest of the group and took our bus to the cruise terminal. More waiting time here in excess of 40 minutes as no pre arranged tickets and again lots of confusion. Eventually got on the cruise and on to the next disappointment. My partner is vegetarian and we had requested and had confirmed a vegetarian meal but he received the same as everyone else which was pretty much all pork. I spoke to Luna but she knew nothing of the request and whilst she offered her rice the whole incident seemed to fluster her and then she made a comment about Indians not eating pork, but my partner was Caucasian so he should. The cruise itself was fine, dinner for me average and my partner had to skip dinner with nothing else available. To top off everything, when we got on the bus to head back to our respective hotels, Luna advised us that she had to get to the Metro station and was the first one dropped off with barely a goodbye. I have never experienced this on a tour before with guides normally staying until the last guests are returned to their hotels. All in all pretty disappointing and hard to recommend. I will acknowledge that Viator and operator provided a partial refund in relation to the lack of the vegetarian meal. The Tour guide was great full of useful information, good English. The water town markets was crowded on the day we went however it was well worth the trip. We tried Shanghai dumplings at one of the little restaurants leading into the markets and they were sensational, and a trip on one of the small boats on the river was lovely. The best way to see all the lights on the Bund is on an cruise and the boat we were on was extremely large, the food was different and eatable just don't expect to much I found the entire day a very enjoyable trip, also made up by the company of fellow travellers from USA Japan and England. The water town was nice to see and a great way to end our stay in Shanghai. We had a few hours to kill in between the water town and the cruise. Cruise was amazing! We were the only ones in VIP section and got a deck to ourselves. Weather was great and the view is amazing. Our guide Dylon English name was the best tour guide we have ever had. His English was good and he was really funny. Made the tour even better. Would definitely recommend.